It was an exciting, busy and profitable week here at RagingBull. There was my (Jeff Bishop) interview with Trish Regan on Tuesday, which I hope you were able to catch. In it, I mentioned a trade that is up almost 25% already. And I think it’s just getting started. Then on Wednesday, Nathan Bear hosted a live options and trading training session. 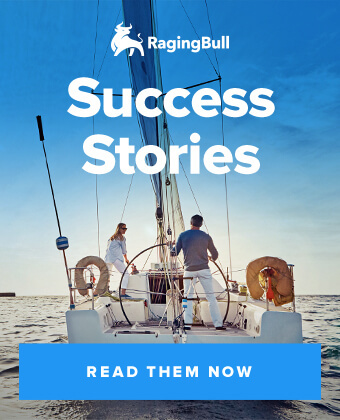 Nathan is joining the Weekly Money Multiplier team, and the live session was an opportunity for Nathan to explain his strategy and for RagingBull members to get to know him. Boom! Nathan sold half the position for 60% and is aiming to score a 100% win on the second half. This is one of the trades Nathan detailed during his training session. 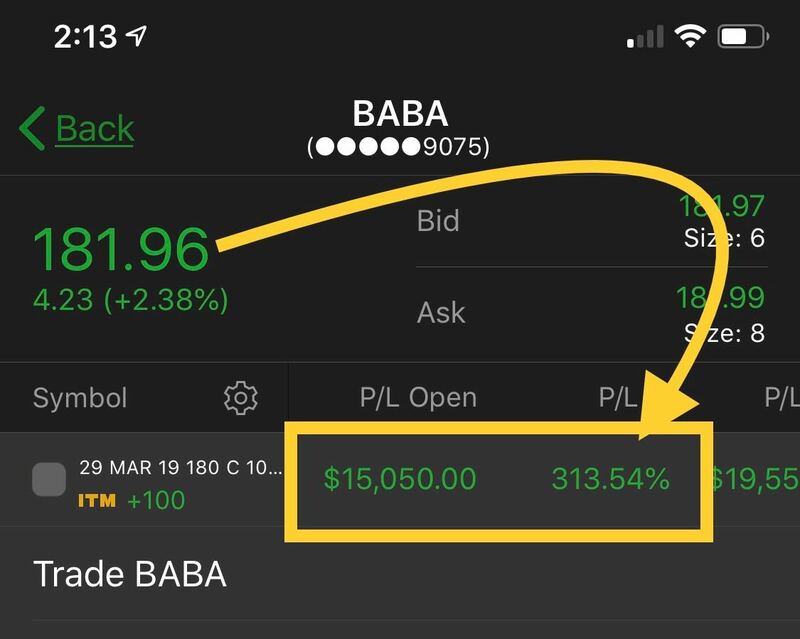 And on Friday, I alerted my members to BABA call options. In just a few hours, members could have made over 300%! I’m excited for tomorrow, there are a LOT of great setups I’m watching. If you’re a Weekly Money Multiplier member, be on the lookout for an email from me. If you’re not, and want to start receiving trade alerts from me and Nathan, you can join us here. If you sign up today for a full year, you get the second year for free. This offer ends tomorrow. Here’s a setup Nathan Bear uncovered while trading live in the Millionaire Roadmap room. The trade is still in play… and it also serves as an excellent example of his strategy. The vast majority of Nathan’s trades are what he calls “TPS setups,” which stands for Trend, Pattern and Squeeze. The thing I really like about this setup is that has over 60% short float (per Finviz)! What does that mean? It means there are a LOT of bets against CVNA. 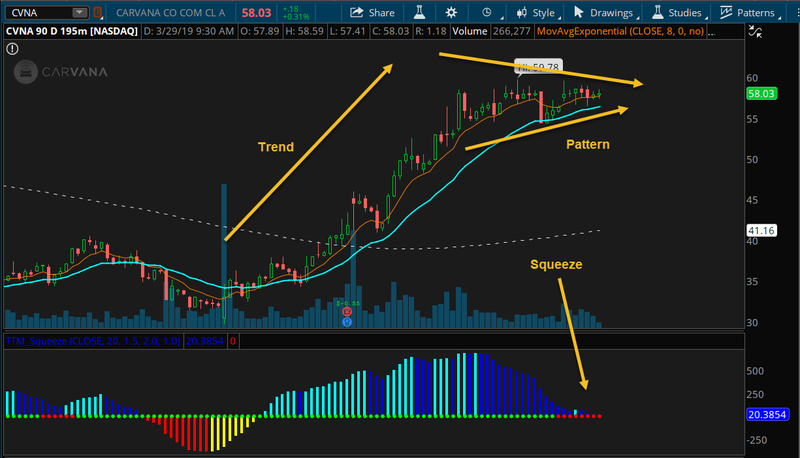 The thing is, if this ticker starts to break out of this bullish pattern, a lot of these short bets will need to start being unwound — aka a short squeeze. Like I said, this trade is still in play. Like any trade, there’s no guarantee it will be a winner. But given Nathan’s win-rate, and the fact that he’s already made $250,000 in profits so far in 2019, I wouldn’t bet against him. 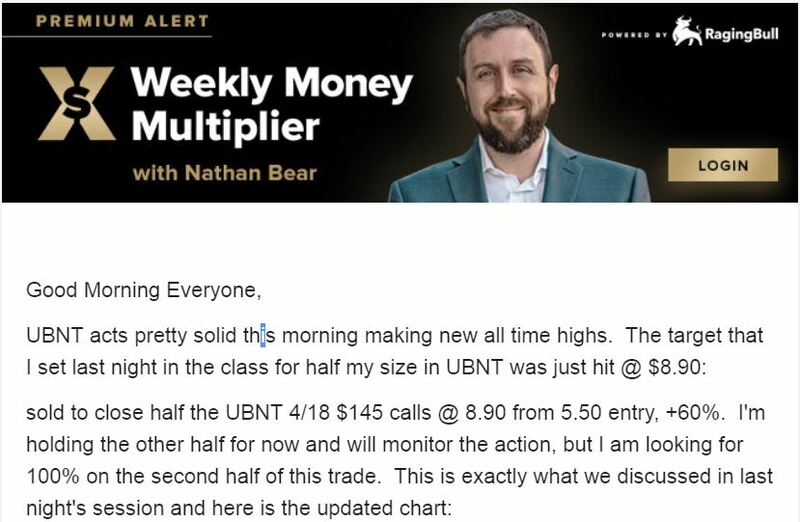 Like I mentioned above, you can start receiving trade alerts from me and Nathan by joining Weekly Money Multiplier (and get a second year free if you join today). If you’re already a member, or simply prefer live coaching, I recommend you check out Millionaire Roadmap. Nathan streams his TD Ameritrade thinkorswim live during market hours in the chat room. He’s often on the mic teaching folks exactly how he finds the trades that made him a millionaire. And of course, you’ll also get access to Jason Bond’s live training and trade alerts in the room as well. 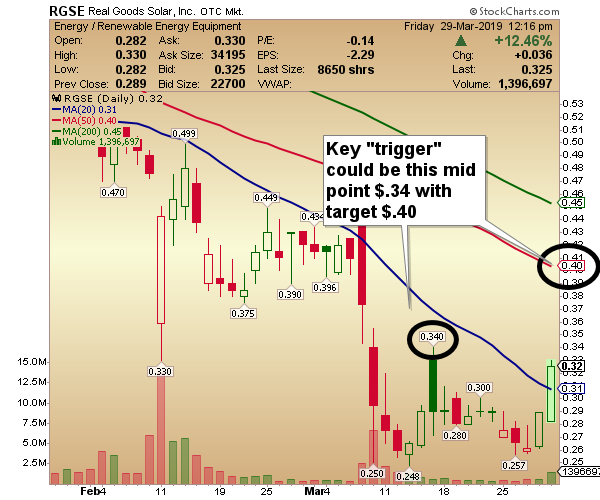 RGSE is coming off a double bottom at around $.25 cents per share. During Friday’s session it broke over the 20-day simple moving average line at $.30. The trade here would be a breakout at $.34, the next chart high, for a run at $.40, the 50-day simple average. My stop would be the 20-day simple moving average line. 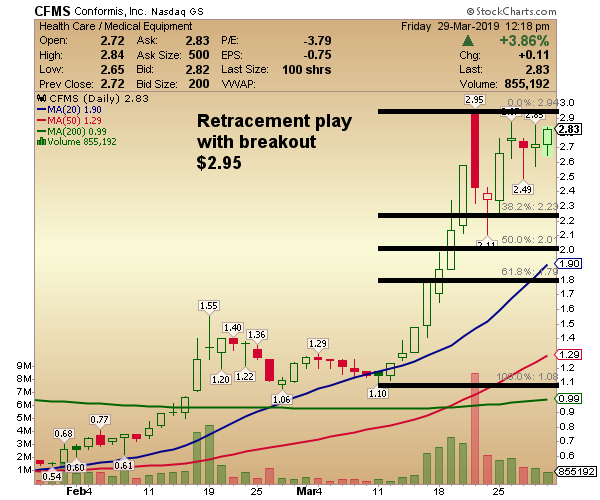 CFMS is a trade that ran from $1.10 to $2.95 in about one week. Recently, however, shares are consolidating between $2.50 and $2.85 area. This is KEY to this trade. I love it when stocks run higher and don’t pull back. This upper level consolidation tells me sellers are not exiting the trade yet, and buyers are still showing interest. While neither is in control right now during this sideways move, I will be looking for a $2.95 break as a trigger with a 10%-15% run higher from there as my target. 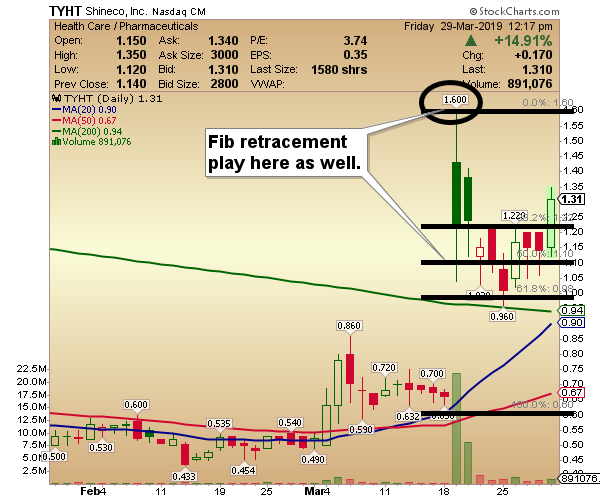 TYHT — Similar to CFMS, it has had a large run from $.63 to $1.60 recently. Shares did pull back some, but it’s also showing a nice sideways consolidation pattern right now in the $1.10 to $1.20 zone. If we see a pop early next week, my target would be the recent high of $1.60. Jeff is also co-founder of The Traders Council. 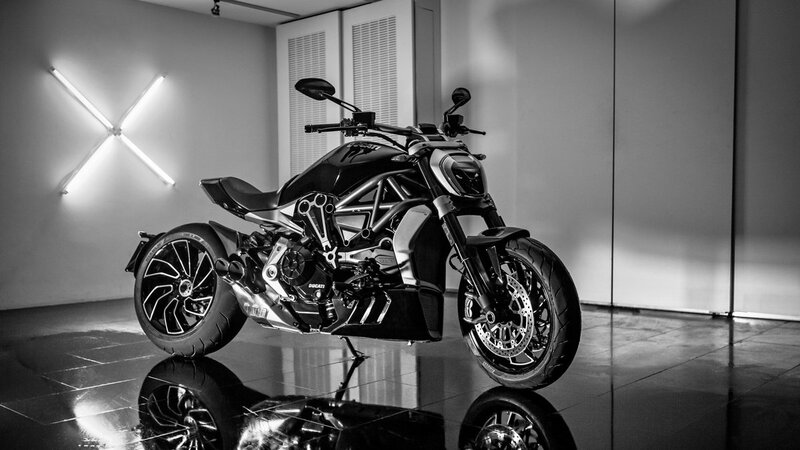 This is an elite service that gives you access to Jeff’s live trading and exclusive training material (you can learn more about it here). Davis Martin is head trader at Daily Profit Machine and head options trader and co-founder of The Traders Council. 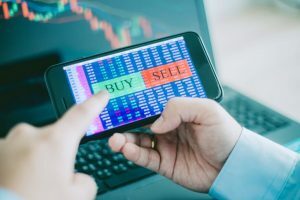 Within the RagingBull community, he is best known for his Trade of the Day — a daily, high-probability SPY (an ETF that tracks the S&P 500) options trade alert sent 30 minutes before the market open. Davis starts his days early to analyze pre-market data before issuing his daily trade — which are designed to take advantage of bullish or bearish market moves. His goal is to deliver double- or even triple digit gains soon after the market opens. Davis says he’s watching the SPY $282 and $280 price levels going into April. The $280 has served as critical support for roughly a month. It has held during a time we’ve seen bearish news regarding Brexit, the inverted yield curve and China trade talks. Davis says a break below $280 would be bearish. The other critical level Davis is watching is $282, which he has identified as a resistance level based on running a technical analysis scan going back a year. On Friday, however, SPY closed above $282. If it can close above $282 for three days, Davis says his market bias will turn bullish. And if SPY is able to hold that level, expect it to turn into a support level, since old resistance levels turn into support. Davis will continue to analyze these levels on a daily basis before releasing his signature SPY Trade of The Day. You can learn more about Davis’ techniques by getting his free Path to Profits ebook here. He’ll show you how to identify support and resistance… create an easy-to-execute trade plan and how you too can profit on a daily basis. 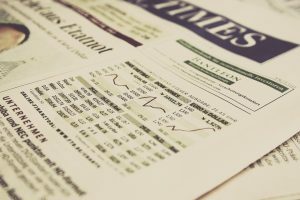 Want to learn how to scan for biotech stocks ready to breakout? Then check out this video by Kyle Dennis. He’ll show you a free site you can use to scan… what criteria he uses to weed out 99% of the stocks he’s not interested in… and even what chart patterns he looks for. And you’ll want to listen to Kyle, he turned $15k into seven figures trading biotech stock. Go here to watch the video and here for more information about Kyle.